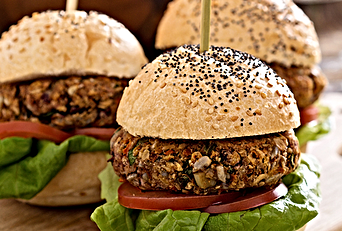 7 Terrific Toppings for Veggie Burgers - Vegans Eat What? Vegans Eat What? For many people, summer and barbecue just go together. We enjoy grilling and that didn’t change when we stopped eating animals. Like many vegans, we grill indoors and out. Apart from the plethora of fresh vegetables – and fruits – that can be cooked on the grill, grilling is a fun way to cook other plant-based foods, including veggie burgers, brats and dogs. Be careful not to overcook store-bought veggie burgers because they are generally pre-cooked and will become hard if left on the grill too long. Freezing homemade veggie burgers prior to grilling them will help the burger hold together better on the grill. Try grilling your favorite store bought or homemade veggie burger (like a Black Bean or Good Burger), then use one or more of the following toppings and enjoy the burger as is, on a lettuce leaf or in between a whole grain bun. We got this recipe at Miyoko Schinner’s cooking demo at Health Fest, 2015 in Marshall Texas. Use the mustard as is, or blend it with horseradish, light miso or even agave to taste. Wisk everything together or mix in a blender until very smooth. Pour the mixture into a saucepan, and simmer 8 to 10 minutes, stirring frequently. Pour into a squeeze bottle. It will thicken as it cools. Peel and pit the avocados then mash them with a fork in a small bowl. Add the remaining ingredients and let sit at room temperature for 30 minutes for flavors to blend. Brown the almonds and sesame seeds in a dry skillet over medium heat stirring frequently so they don’t burn. Once browned, remove the nuts and seeds from the pan and let cool. Mix the shredded cabbage and green onions in a large bowl. When the nuts and sesame seeds are cool, add them to the slaw mix. Mix the dressing ingredients together. Right before serving, break the ramen noodles apart over the salad. Shake or stir the dressing ingredients and pour on top of the salad. Toss well & serve as a side salad or over a veggie burger! Note: The spice packet for the ramen noodles is generally full of MSG and other things you do not want to eat. Justina suggests that you throw it out! Heat the olive oil or Earth Balance in a pan over medium heat. Add the chopped onion and sauté, stirring occasionally, until soft. Turn the heat up a bit and add the mushrooms, salt and nutmeg. Cook about 5 minutes or until the mushrooms release their liquid. Add the sherry and cook another 5 minutes. In a small bowl, whisk the flour and water together. Turn the flame down and add the water/flour slurry to the mushroom mixture. Cook to desired consistency stirring constantly.